371. If the imports in 1998 was Rs. 250 and the total exports in the years 1998 and 1999 together was Rs. 500 then the imports in 1999 was ? 372. The imports were minimum proportionate to the exports of the company in the year ? 373. What was the percentage increase in imports from 1997 to 1998 ? 374. 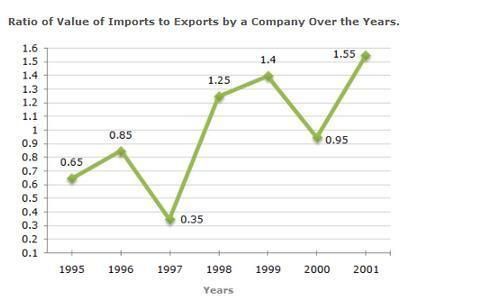 If the imports of the company in 1996 was Rs. 2 720 000 000 , the exports from the company in 1996 was ? 375. In how many of the given years were the exports more than the imports ?